Some people are remembered for a few years after their demise. Some are famous enough to be remembered for centuries. Only there are a few who are remembered by humanity for many millania. Vasudeva Krishna, Yadava, was such a great personality. Most conservative historical estimate place Krishna to be born before 1000 BC. Krishna was the son of the Yadava chief Vasudeva and his wife Devaki. Hence he was known as Vasudeva Krishna or Vaasudeva. In this blog I am trying to analyze Krishna's personality as a human being. We all know the divinity of Krishna and the influence he has on Hindu religion and on the devotees spread across the world. I am here focusing on the life of Krishna as a statesman, political reformer and a great philosopher. Krishna was born in the race of Yadu, the son of Aila king Yayati and Devayani (daughter of the Asura priest Sukra). Devayani was a Brahmana while Yayati was a Kshatriya. The son of a Kshatriya upon a Brahmana woman was considered as a Suta whose occupation was to ride chariots of kings and to become assistants of kings. Though during the time of Yayati, caste was very flexible and not well defined, during the later stages it started becoming rigid. The race of the Yadus was not given the same status as of the race of the Purus (Yayati's younger son) even in the days of Yayati. Instead of calling Yadus to be Sutas, it was proclaimed that the Yadu-clan is cursed. The reason for the curse was explained away as a fable. (Yayati cursed his son Yadu when Yayati asked Yadu to take his old-age and Yadu refused). Puru was the son of Kshatriya Yayati and his Kshatriya wife Sarmistha (the daughter of king Vrishaparva of Asura race). Puru and his race was not cursed since Puru's birth follows the dictates of the caste-system. (But the fable won't say this but give a different explanation: Puru agreed to what Yadu refused and so he was awarded the throne and his race was blessed). The Bharatas and the Kurus descended from the race of Puru and had the same contempt for the Yadus or the Yadavas. Thus Krishna was not considered a high-born by birth, especially by the conservative sections of the Kurus and their Brahmana priests, since he belonged to the Yadu's race. Yet he became a great statesman, war-strategist and philosopher of his age. He was a younger contemporary to yet another statesman Vidura who was the minister of Kuru king Dhritarashtra. Krishna played more or less similar role to the Yadava king Ugrasena that Vidura did as a minister to Kuru king Dhritarashtra. Vidura was believed to be the son of a Sudra women and was a low born like Krishna. He was also contemporary to Karna who lived as a Suta. Karna was actually born to Kunti the mother of the Pandavas, thus an elder brother of the five Pandavas. But since he was adopted by Suta Adhiratha and his wife Radha, he was known to the world as a Suta, thus considered to be low-born. Krishna had to suffer humiliation at the hands of many like Jarasandha, Sishupala and especially Duryodhana due to his low birth, while the Pandavas and Vyasa acknowledged his greatness. Vyasa, the author of Mahabharata himself was born of a Sudra woman Satyavati, who later became the queen of Kuru king Santanu. Similarly Karna too had to suffer humiliation by others like Bhima and Kripa due to his caste. Vidura too because of his low birth could not get sovereignty of the kingdom in spite of his unparalleled wisdom. Vyasa was not accepted by many of his contemporaries, which is evident from many passages in Mahabharata that tries to defame him. Out of all these men, Krishna was of a spirited soul and his charismatic nature won a lot of admiration from everybody with whom he interacted, even from hard hearted men like Duryodhana. Mahabharata also has several passages where Krishna is mentioned as having affectionate interactions with Vidura, Karna and Vyasa, as all of them shared the burden of low-born status. Though the Pandavas had glorified fables about their births, they too was considered by many to have a questionable birth. This was even so for Panchali, the queen of the Pandavas. Thus they too shared a common bond with Krishna. Many hostile men like Duryodhana considered him to be of the status of a Suta. Knowing that many among the Kurus consider the members of the Yadu clan to be Sutas, Krishna intentionally chose to become a chariot-driver of Arjuna which is the job of a Suta. But Krishna turned it to a joyful exercise and mocked the caste system that was strengthening its tentacles into the Indian society. He converted it into a philosophical symbolism where the intellect (Krishna) guides the soul (Arjuna), in a chariot (the body), driven by the senses (the horses). He also proclaimed in his Gita sermon that the four orders of caste are based on once nature (guna) and acts (karma). Thus he denies caste which is based on ones birth. He also consider himself to be the creator of this new definition of caste (chatur-varnya) and the destroyer of the old definition based on birth. Vidura silently accepted his low status in the society but shone high with his wisdom. Vyasa's fight with the evils of the society including the caste system was evident in his own history embedded in Mahabharata and the way he devised his epic history Jaya to grow into the great epic Mahabharata. Vyasa seems to ally with Krishna in establishing a new political system, a new philosophy and a new religion as well as a new way of life by demolishing the systems that prevailed in their time. Contrast this with the fight of Karna against his perceived low birth. His dislike of Arjuna started when Kripa proclaimed that he cannot have a dual fight with Arjuna in a fighting competition since he was a Suta. He also disliked Bhima as Bhima too humiliated him for his caste. He thus disliked all the five Pandavas due to his dislike of Arjuna and Bhima. He became the great friend of Duryodhana who immediately opposed Bhima and upgraded Karna's status by making him the king of Anga, though this was an opportunistic move. He also hated Panchali who refused to allow him to participate in the archery competition to win her as bride, invoking his Suta caste and as revenge Karna instigated Duryodhana to disrobe her in the midst of the royal assembly hall. He also derived pleasure in making Shalya, a king and a Kshatria, to be his chariot-driver! Though Karna was a victim of caste system, he was a supporter of this system, as is evident from his contempt of the culture of Shalya, (Bahlika Culture) which was more liberal on caste. Shalya's culture permitted one to be a Brahmana and later become a Kshatriya or a Vaishya as one choses or vice versa. One member in a family can be a Brahmana while others can be a Kshatriya, a Vaisya or a Sudra. But Karna criticized all these and rebuked Shalya for having such a culture. No wonder Krishna cannot be on the side of Karna, despite some common traits they shared. Both were raised by foster parents. Karna was raised by foster parents Adhiratha and Radha where as Krishna was raised by foster parents Nanda Gopa and Yasoda. Their philosophy was never similar. However Krishna shared the same philosophical ground with Yudhisthira, who in his famous conversation with Naga, Nahusha proclaimed that caste was not based on birth but based on once merit and conduct. No surprise why Krishna allied with Yudhishthira and worked for making Yudhishthira the ruler of the land. It is sad to see that the later society of India, failed this vision of Krishna and Yudhisthira. Krishna is made into a God to be worshiped in temples and king Yudhisthira was forgotten into the dark corners of history, nay, mythology. The society dipped into the worst form of caste system from which it is recovering only now. Krishna was the key political figure, in overthrowing Kansa the king of the Kingdom of Surasena (Mathura district in Uttar_Pradesh, India). The kingdom of Surasena was the native kingdom of the Yadava clans constituted by the Andhakas, Vrishnis and Bhojas. It was a beautiful kingdom situated on the banks of river Yamuna and lied to the south of the powerful kingdom of the Kurus (Faisabad district in Uttar Pradesh as well as eastern parts of Hariyana). Its capital was Mathura, a city which retains its name even today. By overthrowing Kansa, Krishna re-established the old king Ugrasena on the throne and stabilized the kingdom, from collapse due to factional fighting within the kingdom. The next threat came from outside the country, from the kingdom of Magadha (Patna district in Bihar, India). The ruler of Magadha, Jarasandha, attacked Surasena many times and weakened its millitary. Krishna and other Yadava chief tried all thier best to hold on. Eventually they had to flee from their native kingdom to the south and to the west. Later, with the initiative of Krishna, the Yadavas who fled from Surasena formed a new kingdom called Dwaraka. Its capital was Dwaravati a city well protected by mountains on all sides, in an island, not far from the Gujarat coast. This made it immune to attacks from land. The kingdom prosepered by sea trade, with sea-faring kingdoms. Dwaraka had ancient roads connecting it to kingdoms like Kamboja (Jammu district, and areas to the west of it in Pakistan) and with major trade routes like Uttarapatha (the Northern Path). Dwaraka's influenced reached to as south as Kerala along the western sea-coast of India, leaving many cultural establishments in Gomanta (Goa), Gokarna (in Karnataka) and Guruvayoor (in Kerala). Krishna established a tie-up of Yadavas with the Pandavas, a faction of Kurus, who were fighting against the established Kuru Kingdom. This tie up prooved profitable to the Yadavas, stratagically. With the help of the Pandavas they overthrew the Magadha king Jarasandha who were thier biggest enemy. Thus the rising power of the Magadhas as a prominent power of ancient India was subdued and the Kurus continued as the major political power of ancient India during the period of Mahabharata epic. For the assistance rendered by the Pandavas in overthrowing Jarasandha, Krishna in turn helped the Pandavas to win the Kurukshetra War against the Kurus headed by Duryodhana. Thus the rule of the Pandava Yudhisthira was re-established by Krishna at Indraprastha (Delhi). In his endevour of supporting the Pandavas, Krishna faced opposition from his own men, including his own brother Bala Rama and other leaders like Kritavarman. However the leaders like Satyaki and Chekitana stood besides him. But Krishna had to pay a price for this polarization among his own people. The Yadava chiefs faught the Kurukshetra War, on both sides, and even after the war ended, the enimity among the Yadava leaders continued. After 36 years, since the Kurukshetra War, another war broke among the Yadavas, in their own kingdom. This resulted in the absolute destruction of the Yadava kingdom in Dwaraka. But the help Krishna extended to the Pandava Yudhisthira, paid off. When the rule of Yudhisthira ended, he established the Yadava prince Vajra on the throne of Indraprashta along with the Kuru prince Parikshit, at Hastinapura. Thus the royal lineage of the Yadavas continued through the prince Vajra. The following sections shows glimpses of Krishna's political life, as a supporter of the Pandava cause, and as a mediater among his own kinsmen. When Pandava Arjuna eloped with the Yadava Princess Subhadra, Krishna pacified his kinsmen with the following words:- (Mahabharata, Book 1, Chapter 223) "Even this is my opinion: go ye cheerfully after Dhananjaya and by conciliation stop him and bring him back. If Partha goes to his city after having vanquished us by force, our fame will be gone. There is no disgrace, however, in conciliation." During the preparations for the Kurukshetra War Pandavas held many discussions camping at Upaplavya (a city in the Kingdom of Matsyas, identified to be in the Alwar district of Rajasthan). Everybody knew that the war will cost a great deal of destruction of human life and wealth. Pandavas, Krishna and other kings discussed on peaceful resolution of the dispute with the Kuru king Duryodhana. Krishna expressed his openion as follows:- (Mahabharata, Book 5, Chapter 5) "As we are desirous of adopting a politic course, this is, no doubt, our first duty; a man acting otherwise would be a great fool. But our relationship to both the Kurus and the Pandus is equal, howsoever these two parties may behave with each other. If that chief of the Kuru race should make peace on equitable terms, then the brotherly feelings between the Kuras and the Pandus will sustain no injury. If on the other hand, the son of Dhritarashtra should wax haughty and from folly refuse to make peace, then, having summoned others, summon us too, for war. " Krishna also offered aid in war for both Pandava Arjuna and Kaurava Duryodhana as both were his kinsmen. (Arjuna was married to Krishna's sister Subhadra and also was the son of his aunt Kunti, the sister of Vasudeva. Duryodhana's son Lakshmana was married to Krishna's daughter). Arjuna was the beloved friend of Krishan and so secretly wished to help him than Duryodhana and spoke thus:- (Mahabharata, Book 5, Chapter 7) "There is a large body of cowherds numbering ten crores, rivalling me in strength and known as the Narayanas, all of whom are able to fight in the thick of battle. These soldiers, irresistible in battle, shall be sent to one of you and I alone, resolved not to fight on the field, and laying down my arms, will go to the other. You may, first select whichever of these two commends itself to you." Arjuna chose Krishna and Krishna's army went to Duryodhana. Krishna served as the key war-strategeist for the Pandavas in the Kurukshetra war. Krishna was chosen by the Pandavas to approach the Kurus as an ambassedor of peace. Mahabharata, Book 5, Chapter 83):- "I will go to king Dhritarashtra, desirous of accomplishing what is consistent with righteousness, what may be beneficial to us, and what also is for the good of the Kurus. " (Mahabharata, Book 12, Chapter 80):- "I never behave with slavish obsequiousness towards my kinsmen by flattering speeches about their prosperity. I give them half of what I have, and forgive their evil speeches. As a fire-stick is grinded by a person desirous of obtaining fire, even so my heart is ground by my kinsmen with their cruel speeches. Indeed those cruel speeches burn my heart every day. Might resides in Sankarshana (Balarama); mildness in Gada; and as regards Pradyumna, he surpasses even myself in beauty of person. Although I have all these on my side yet I am helpless. Many others among the Andhakas and the Vrishnis are possessed of great prosperity and might, and during courage and constant perseverance. He on whose side they do not range themselves meets with destruction. He, on the other hand, on whose side they do range themselves, achieves everything. Dissuaded (in turns) by both (viz., Ahuka and Akrura,) I do not side either of them. What can be more painful for a person than to have both Ahuka and Akrura on his side? What, again, can be more painful for one than not to have both of them on his side I am like the mother of two brothers gambling against each other, invoking victory to both. I am thus, afflicted by both." The epic Mahabharata describes many battles fought by Krishna, and his conquest of various kingdoms. He defeated the king Naraka of Prakjyotisha (Gohati). He also conqured Bana or Vana of Sonitapura (Sonitpur of Assam), to the east of Prakjyotisha. (Some historians consider the location of Prakjyotisha and Sonitapura to be along the Sindhu river in Pakistan). Bana later became an ally, as Krishna's grandson Aniruddha married Usha, the daughter of Bana. He belonged to the Daitya clan of Asuras. In (Mahabharata, Book 5, Chapter 62), Krishna is described as the slayer of Vana and Bhumi’s son (Naraka). Krishna married Rukmini, his first wife, by abducting her from the Vidarbha Kingdom (Vidarbha retains it name as the Vidarbha region in Maharashtra). He also abducted and married a Gandhara princess in the same manner. Krishna aslo attacked and conqured the Pandya Kingdom in the south. More research is needed to ascertain if these battles indeed occurred or if they were later interpolations to portray Krishna as a war-hero, which he was not and which is unnecessary. One suspect-point is the reference in Mahabharata that king Naraka of Prakjyotisha was slain by Bhagadatta and not by Krishna. Bhagadatta succeeded Naraka at Prakjyotisha as king. Some interpolators has styled Bhagadatta as the son of Naraka who succeeded Naraka, but actually it seems he succeeded Naraka as king of Prakjyotisha but after defeating Naraka, not because he was son of Naraka. Bhagadatta seems to be a Yavana chief. Krishna's battle with the the southern Pandyas too is shrouded in mystery. However in Kurukshetra war we see that Pandya king sided with the Pandavas based on the advise and initiative of Krishna. It is possible that some other Yadava chief battled with the Pandyas on the advise of Krishna, as the Pandyas in the south and the Dwarakas in the west were competing each other to get territories in the southern Indian peninsula. Krishna's battle with the Vidarbhas and the marriage with Rukmini seems to be real. The battle with Gandharas could be real, given the opposition and competition between Dwaraka and Gandhara for economical and political dominance. One of the most astonishing aspect of Krishna was the Philosopher in him. He is attributed as the originator of the famous Bhagavat Gita. How he amassed this great knowledge is revealed in the Anugita chapters of Mahabharata, which stats that he got this knowledge by interactions with many learned men, and by his own meditations. The following was what Krishna told to Arjuna when later told to repeat what he discoursed as Bhagavat Gita, in the midst of the Kurukshetra War. Bhagavat Gita in Krishna's own Words (Mahabharata, Book 14, Chapter 16):- "I made thee listen to truths that are regarded as mysteries. I imparted to thee truths that are eternal. Verily, I discoursed to thee on Religion in its true form and on all the eternal regions. It is exceedingly disagreeable to me to learn that thou didst not, from folly, receive what I imparted. The recollection of all that I told thee on that occasion will not come to me now. Without doubt, O son of Pandu, thou art destitute of faith and thy understanding is not good. It is impossible for me, O Dhananjaya (Arjuna), to repeat, in detail, all that I said on that occasion. That religion about which I discoursed to thee then is more than sufficient for understanding Brahma. I cannot discourse on it again in detail. I discoursed to thee on Supreme Brahma, having concentrated myself in Yoga." Krishna mentions about the knowledge he obtained from a certain Brahmana. (Mahabharata, Book 14, Chapter 16):- "On one occasion, a Brahmana came to us. Of irresistible energy, he came from the regions of the Grandsire. He was duly reverenced by us. Listen, to what he, said, in answer to our enquiries.The Brahmana said, That which thou askest me, O Krishna, connected with the religion of Moksha (Emancipation), led by thy compassion for all creatures and not for thy own good,—that, indeed, which destroys all delusion, O thou that art possessed of supreme puissance I shall now tell thee duly. Do thou listen with concentrated attention as I discourse to thee." - words of Krishna. It seems sage Kapila, a predecessor of Krishna and belonging to the Yadava lineage, too had great influence on Krishna. Kapila's Samkhya philosophy was described in great detail by Krishna in the second chapter of Gita. Krishna's own philosophy of Karma Yoga which is at variance with asceticism and with ritualistic Vedism has its basis upon Samkhya philosophy. (Mahabharata, Book 6, Chapter 26):- "There is no objective existence of anything that is distinct from the soul; nor non-existence of anything possessing the virtues of the soul. This conclusion in respect of both these hath been arrived at by those that know the truths of things. Know that the soul to be immortal by which all this [universe] is pervaded. No one can compass the destruction of that which is imperishable. It hath been said that those bodies of the Embodied soul which is eternal, indestructible and infinite, have an end." (Mahabharata, Book 6, Chapter 26]):- "As a man, casting off robes that are worn out, putteth on others that are new, so the Embodied (soul), casting off bodies that are worn out, entereth other bodies that are new. Weapons cleave it not, fire consumeth it not; the waters do not drench it, nor doth the wind waste it. It is incapable of being cut, burnt, drenched, or dried up. It is unchangeable, all-pervading, stable, firm, and eternal. It is said to be imperceivable, inconceivable and unchangeable. " (Mahabharata, Book 6, Chapter 26):- "All beings (before birth) were unmanifest. Only during an interval (between birth and death), O Bharata, are they manifest; and then again, when death comes, they become (once more) unmanifest. " (Mahabharata, Book 6, Chapter 27):- "In this world, two kinds of devotion; that of the Sankhyas through knowledge and that of the yogins through work." (Mahabharata, Book 6, Chapter 29) Arjuna said,—"Thou applaudest, O Krishna, the abandonment of actions, and again the application (to them). Tell me definitely which one of these two is superior." The Holy One said—"Both abandonment of actions and application to actions lead to emancipation. But of these, application to action is superior to abandonment. He should always be known to be an ascetic who hath no aversion nor desire. For, being free from pairs of opposites, he is easily released from the bonds of action. (Mahabharata, Book 6, Chapter 29):- "He who is wise never taketh pleasure in these that have a beginning and an end. " Mahabharata is the oldest text mentioning about Krishna and is authentic about his true charecter. Harivamsa, a later addition to Mahabharata as well as Mahabhagavata_Purana speak about his childhood and his role as a lover among the milk-maids (Gopikas) in the villages (Gokula and Vrindavana) where Krishna passed his childhood and tean-age days. The Bhakti cult which describe Krishna as an incarnation of Vishnu ( a Vedic God ), gave more importance to this aspect of Krishna, viz that of a charming and carishmatic child who did miracles and that of a tean age lover. While there is no harm in any of these interpretations, one should not forget the real personality of Krishna and his teachings. It is the tendency of lazy humans to deify a fellow human who did things which are beyond ordinary human capacity, ignoring all the human-effort they put in. It is an excuse for not trying hard, so that one can say:- well Krishna and Raama were able to do all these things that they did because they were gods; don't expect same effort from me since I am just a human. Some others on the other hand try to find only faults and use them in support for their falsehood, justifying polygamy and the like. Like one is made to believe by the Puranas, Krishna never married 16,008 women, nor did he lusted around women. Krishna treated both men and women equally, with no difference in interacting with them and spread his philosophy of Yoga to both men and women equally. Hence he had many followers among men and women. I have read most of your articles and some of your ‘postulates’ are extremely useful for further research. I call them ‘postulates’ because in some places more evidences or references are needed. I shall comment on them (they are my views only) later. It is also interesting to know that you are a good artist too. Your paintings are excellent. Here is my doubt on your analysis about the Yadu tribe. You may agree that based on the references in Mahabharata and Bhagavata Purana that Yadus were leading a pastoral life moving from one place to other, rearing cattle. Rearing of cattle was their main occupation. So I find it difficult to consider them as Sutas, whose occupation was driving chariots and sometimes singing songs in praise of kings. Krishna’s choice to become chariot driver of Arjuna was just an exception case. You too consider Krishna to be a war-strategist, so I think becoming the driver of Arjuna is the best way he can communicate his strategies and implement them quickly in an ongoing battle. Thanks for posting valuable comments on my articles. In fact, through this site what I want to achieve is to raise some thought on various topics of Mahabharata, thus enhancing further research on these topics. I will try to establish references and evidences as much as I can, and anticipate further studies by myself as well as by other interested researchers for taking these assumptions, which you consider as 'postulates' to the next level, may be into a solid theory. Thanks for appreciating my art-works. Hope you also have seen the 3D models and the interactive visualizations developed by writing computer programs, along with the paintings. I agree with your point about the pastoral roots of the Yadu tribe. May be they started as pastoral nomads rearing cattle and later developed royalty and kingship. This case is similar to the Matsya tribe which had their humble beginning as fishermen on the banks of Saraswati and later developed royalty and kingship. 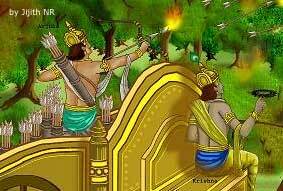 Krishna is mentioned as driving chariot of Arjuna not just during Kirukshetra war, but also during the burning of Khandava forest. However, the 'Suta' terminology is applied to Yadus not just because Krishna, a member of this tribe is found to be Arjuna's chariot-driver. It is also because Mahabharata mentions Yadu's tribe as inferior to his younger brother Puru's tribe. The reason for inferiority is explained away by using a myth of curse. Yayati, the father of Yadu and Puru and their brothers gave sovereignty only to Puru and cursed all others including Yadu for refusing to exchange his old age with their youth. One way of looking at this is to accept this myth-of-curse by face-value. However I am in favor of a more rational reason. Please see my article on de-mystifying-myths on various approaches to analyse myths. In Santi Parva we find a passage defining Sutas as off-springs born to a Kshatriya man in a Brahmana woman. Yadu's father Yayati was a Kshatriya and his mother Devayani was a Brahmana. Thus technically Yadu was a Suta. But, during the days of Yadu, caste (varna) was not very rigid. We find no objection in Yayati marrying Devayani. So the perceived inferiority of Yadus in comparison to Purus emerged later. The definition in Santi Parva about Sutas and other mixed castes emerged later. Since Karna was perceived as a Suta and became the subject of humiliation, we can conclude that Sutas were considered inferior during the time of Pandavas. So during the time of Pandavas, caste was indeed a problem area in the society. Probably it was the people during this period that considered Yadu's tribe as inferior to Purus. The fable about the curse on Yadu was probably invented by them. I also believe that this view was entertained only by some section of the Purus, probably an orthodox / conservative minority among the Purus. Thus the Yadus did what ever they were doing (rearing cattle, leading a pastoral life, later attaining kingships, royalty and permanent settlements) while some orthodox members of the Puru tribe considered them to be Sutas or otherwise cursed or inferior to the Purus. Thus the dictate that a Suta should ride chariots or become bards who compose songs in praise of kings and warriors, was just the opinion of some orthodox Purus (I include the Kuru king Duryodhana as one among these orthodox Puru group). What Krishna did by becoming driver of Arjuna's chariot, among many other things (like to enable him to form war-strategies and implement them quickly, as you said) was also for mocking the conservative / orthodox views of people like Duryodhana, who considered Yadus as inferior to them, equating them to Sutas who according to them are to drive chariots or sing songs in praise of kings. Śrī Caitanya Mahāprabhu is known as mahā-vadānyāvatāra, the most magnanimous incarnation, for He does not consider the offenses of the fallen souls. CC Adi 7.4, Purport: As preachers of the Kṛṣṇa consciousness movement, we first offer our obeisances to Śrī Caitanya Mahāprabhu by chanting this Pañca-tattva mantra; then we say Hare Kṛṣṇa, Hare Kṛṣṇa, Kṛṣṇa Kṛṣṇa, Hare Hare/ Hare Rāma, Hare Rāma, Rāma Rāma, Hare Hare. There are ten offenses in the chanting of the Hare Kṛṣṇa mahā-mantra, but these are not considered in the chanting of the Pañca-tattva mantra, namely, śrī-kṛṣṇa-caitanya prabhu-nityānanda śrī-advaita gadādhara śrīvāsādi-gaura-bhakta-vṛnda. Śrī Caitanya Mahāprabhu is known as mahā-vadānyāvatāra, the most magnanimous incarnation, for He does not consider the offenses of the fallen souls. Thus to derive the full benefit of the chanting of the mahā-mantra (Hare Kṛṣṇa, Hare Kṛṣṇa, Kṛṣṇa Kṛṣṇa, Hare Hare/ Hare Rāma, Hare Rāma, Rāma Rāma, Hare Hare), we must first take shelter of Śrī Caitanya Mahāprabhu, learn the Pañca-tattva mahā-mantra, and then chant the Hare Kṛṣṇa mahā-mantra. That will be very effective. Thanks fallen for your comments. If you are passionate about the teachings of Krishna, you should read the original Bhagavat Gita, found as part of Mahabharata (Mbh.6.25:- Bhishma Parva Chapter 25 onwards), not re-interpreted by anybody, and if possible the original Sanskrit texts. Given a choice, I would prefer Mahabharata than Bhagavata Purana to know about Krishna and his teachings. In the search for knowing the ultimate truth, one must first take shelter of one's own sense organs. Once whatever that can be known by the sense organs is known, one must take shelter of one's own mind. Once whatever that can be known by the mind is known, one must take shelter of one's own intellect. Once whatever that can be known by the intellect is known, ONLY then must one abandon the intellect and proceed to attain the ultimate. Krishna does not like people who loose their brains, and chant his name millions of times because somebody said so. I guess you are not among those who do so. I guess you know about the true purpose and meaning when you chant his name. The content of this comment is moved to http://ancientvoice.wikidot.com/guest:greatness-of-devotion - the greatness of devotion. I appreciciate your efforts analyzing Maha Bharata. and let me have your input. Your explanation about Divya Astras being a Yogic state effected by concentration of mind seems to be plausible, especially since the whole world is indeed constructed using concentrated thought. The fabric of the universe is pure "data" / "information" / "knowledge" and it is fabricated using concentrated though. Hence a person situated in the Yogic state, as mentioned by you and applying concentrated though can tap into the fabric of the universe. While thus engaged, the medium of interaction with the universe can be as trivial a thing like an arrow made of ordinary materials (like wood embellished by sharpened metals at its head and feathers at its tail), shot from a bow which again is made of trivial materials (like wood and copper). I have experienced the effect of concentration you mentioned while playing caroms. The hitting of the target accurately is indeed the result of the player's concentrated state of mind, manifested in the physical world as the accuracy of the shot. In case of Divya Astras, it is not only hitting the target accurately but also producing physical effects like fire, rain, wind or explosion is also involved. So I guess a grater level of mind manipulation over matter is involved here. My personal life too had experienced "astras" in the form of concentrated thought directed towards the cosmic mind, which in turn materialize the results in my life as I desire it. Many phases in my life and many surprising events and experiences I had so far in my life was the result of such "astras" or concentrated thought. A very interesting blog, you have! My best wishes for your noble plan for starting an 'ashram' / organization for studying and experiencing this effect further. Thanks for your input.Also,I appreciate your personal experience with the Divine Weapons. In fact,my yogic efforts started when I happened to visit one of the persons(most strikingly similar to those ancient warriors) of whom I mentioned in my article.It was Yudhistira looking person.He was introduced to me by my Parasuram loooking Guru.I had an innate intuitive ability of sensing the state of mind and using the same state of mind(astra) of what my opponent was using while at play apart from using some other states too. I happened to use them very elegantly and effortlessly where as I found some of the other people 'struggling' with their shot making despite good amount of practice.This kind of strange phenomenon was always a question mark for me. It was when I was in a practice session with Yudhistira looking person,I found in him the same or even extreme struggle with his particular state of mind.Then i decided to work on what actually all these states are,as it seemed a part from my general philosophical interest the very 'subjectivity of motion'.It took 24 years to chalk out all those A to Z states with all the details of what and how of them.Yudhistira looking person really seemed to me as if affected by Kali more than any other person.He is strong,intelligent,bold,almost perfect and above all a very strict practitioner of all the humanly possible virtues…yet he was very much upset with his failure to maintain his perfect 'yogic state of mind' at play. I was also very astounded with the power of his 'state of mind' when I started using it,intuitively yet.I almost stopped playing with him/others and got engaged in deep meditative study.I restricted my play only for the sake of study through yogic efforts using a carom board and billiard board as my tools. This is how my journey started and finally,could unearth the whole of that science. Hopefully you got my point. Just to bring to your notice on who a Suta is. Manu smrithi chapter 10 gives an account of the people born of cross marriages. The person born of a marriage between Kshatriya male and Brhamin female is called as Suta. The job allotted to him is tending horses and driving chariots. From this chapter of Manu smrithi it is known the people from cross marriages were not considered as pure varnas. Pure varna was determined by the attitude that gave rise to a specific capability to do specific jobs (swabhava becoming the cause of the swa karma). Pure varnas are 4 in number (Brahmin, Kshathriya, vaisya and shudra). When varnas got mixed, the swa karma will vary. Depending on the kind of the attitude supposed to have been inherited from the crossed varnas, the off spring is given a new name and allotted jobs in tandem with the inherited attitude. The offsprings were settled outside the Saraswathy basin. Saraswathy basin was occupied by pure varnas only. You will make this out from Varahamihira's Brihad samhitha. There is a chapter on the countries of Bharat given in the shape of a Kurma, called Kurma chakra. There you come across the names of places and their locations. You will be surprised to see that most names of Manu's crossed varnas are by themselves names of places in Bharat. Example:- Nishada, Vaideha, Dravida, Abhiras etc. Nishada is one who is born to Brahmin male and a Shudra female. Vaideha is born to Vaisya male and a Brahmin female. Dravida is the offspring in Kshtriya lineage who has deviated from kashatriya dharma. In Brihad samhita his place is in the present day North Karnataka along the western ghats. Thus the roots of all these clans can be understood from Manu smrithi. Among them, Suta has a special role. In chapter 84 of Shanti parva he is included in the council of ministers that a king must have. 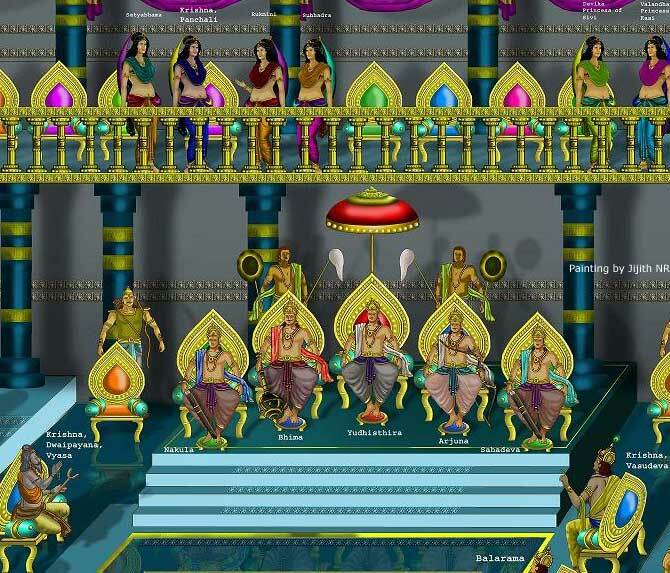 Bheeshma says that a king must have 4 Brahmins, 18 kshathriyas, 21 vaisyas, 3 shudras and one Suta as his ministers. The translation that you have is not exact on this particular verse. The Tamil translation that I have ( written 80 years ago by sanskrit and Tamil scholars of Kumbakonam) adds the other attributes given in that verse to Suta only. They are the 8 cardinal virtues and a sense of dignity, free from envy, conversant with the Srutis and the Smritis, humble, impartial, competent to readily decide in the midst of disputants urging different courses of action, free from covetousness, and from the seven dreadful vices called Vyasanas. Thus a Suta is prized possession for a king. Suta has played a vital role. Examples :- Sumanthra to dasaratha, Matali to Rama, sanjaya to Dritharashtra and krishna (though not a Suta by birth but only by work) to Arjuna. Thanks Jayasree for your valuable comments and for the references from Manu-smriti and from the Tamil translation of the verse in chapter 12:84. I agree with your observation that the mixed races moved out from the Saraswati basin. I will also add the Magadhas to the list along with the Nishadas, Vaidehas and the Dravidas. Without Sutas we probably would not have known about Mahabharata. Sanjaya the Suta was its primary orator and Ugrasrava Sauti the Suta was its final orator in the current form by which Mahabharata is known to us. I guess apart from tending horses, riding chariot, attending to king as ministers or otherwise, Sutas actively participated in propagating Vedic knowledge by embedding them through epic narrations. They became custodians of the fifth Veda viz. the Mahabharata. I am also pondering an interesting question:- Information about Varnas (caste) is found in Mahabharata and in Manusmriti. Which originated first? Mahabharata can be considered as a river of information which flowed from 3000 BCE to 500 CE. Did a dis-tributary of Manusmriti merged with Mahabharata or a dis-tributary of Mahabharata (verses from book 12 and 13) merged with Manusmriti? Obviously Manusmriti seems to be more focused on the subject (varna and social structures) while Mahabharata talks about it amidst many other topics. My thoughts on the last paragraph of your mail. Both the Ithihasas give valuable leads to the past. For instance on identification of the area of uttarkuru, Shugreeva's directions to vanaras on the search of the Northern countries (Kishkindha khand - chapter 43) locates it at Siberia north of lake Baikal. On varnas, I consider that it exists in nature. Any human being can be assessed of his mental faculties on the basis of the three gunas and the four varnas. Manu did a detailed study of it for the purpose of human resource management. If you read the 10th chapter of Manu smrithi, it has a discussion on how to find out the kind of mentality that an offspring will inherit from the parents of same varna (mental nature) and different vanrans. The result of this research is the now infamous Manu neeti!! After every deluge, Manu comes into being. I consider the yuga classification of Markandeya as more relevant as it coincides with one precession of Equinoxes which coincides with a deluge due to melting of Ice age. Refinement of Markandeya's classification has been worked out by me in this link. In my opinion Mahabharatha is not about Manu neeti. It is about danda neeti and how it was being practiced and violated in the past. The story itself is about how humans behave and what kind of danda neeti is needed in a given situation. In Shanti parva, danda neeti is discussed under the caption Raj dharma ( as per the Tamil translation I have) and it comes after chapter 65 or so. Hi Jayasree, good to see your links. Some of them are in Tamil, which i could not understand. While i am not in agreement with some of your findings I am interested in some others like the one about the northern Chedi of Uparichara Vasu and that of the Chola - Sivi link. I wish all the best for your ongoing research. Did any tribe or men from forest attack Dwaraka and took away the wives of Krishna? If so, what was that incident> Was Krishna in Dwarak when the incident occured? How did Rukmini and Sathyabhama die? Yes. This incident happened soon after Dwaraka sub merged into sea and after the death of Krishna. The women were not exactly the wives of Krishna (though that is one interpretation) but the women-folk among the Yadava tribe who were led by Arjuna from the destroyed city of Dwaraka to the city of Indraprastha in order to rehabilitate them. Then tribes of Abhiras attacked Arjuna and took away these women. It was like, these women were flood-victims, who, on the way of their rescue-mission, were abducted by some robber tribes. Satyabhama became an ascetic. Rukmini ascended the funeral pyre. Some versions of Mahabharata say that both of them became ascetics and taught the philosophy of Krishna to the next generation of men and women. Krushna and Jambavati's's son, Samb had married Lakshmana, daughter of Duryodhan. At Lakshman's svayamvar, Samb tried to carry her away, but was caught and imprisoned by the Kauravas. Being Duryodhan's wrestling guru, BalaRama went to secure his release but found the Kauravas haughty and unfriendly. Enrage, Balarama dragged Hastinapur towards the Ganges with his mighty plow. Fearing death and destruction, Kauravas freed Samb and married Lakshmana to the Yadav prince. Krishana the great personality is perfectly explained in the post. Thanks for the such a great information for Krishna and other related aspect of the Krishna and Mahabartha.Mahabharata and Bhagavata are great Epics of Hinduism and mythology. The explanation and presentation is appreciable. Pandit Kota Venkata Chelam has established that the Mahabharata War took place in 3138 BC and the Kaliyuga started in 3102 BC , when Krishna ended his life. Yes. I am also subscribing to the date of 3102 BCE for Kali Yuga Start, which make Krishna to be born around 3200 BCE. Here I was referring to the view of orthodox historians who think Mahabharata war to be occurred around 900 BCE. See my article on Yugas which describes the pre-history of India from 12,000 BCE on-wards. were living along side during that time . More probable date of Krisha was around 3000 BCE (To be precise in around 3150 BCE. Krishna died in 3102 BCE, which the Hindus comemmorate as the start of Kali Yuga) . I am not in favor of 1000 BCE date which is derived based on the flawed Aryan Invasion theory. Nor am I in favor of 5000 BCE date. At 5000 BCE it was Kusasthali not Dwaraka. Kusasthali was the older city which got submerged much before the birth of Krishna. Mahabharata also gives a faithful record of how Kusasthali got submerged and how Dwaraka was built by Vishvakarmas there after its re-emergence. Marine archeology at Dvaraka area too reveals signs of several submergence and re-emergence of this region in the last 10,000 years. Vishvakarma means a 'generic engineer / generic architect', the likes of people who built towns and mansions which are now excavated as part of Indus valley culture. The Puranas converted this 'Vishvakarma' into a mythological figure and say that this 'Vishvakarma is the architect of the Devas'. It is us (living in 21st century) who give the name 'Indus Valley Civilization' to the civilization that existed in that area when Krishna was around there. This area (ie Indus Valley Cultural territory) was then the territory mentioned in Mahabharata as Dvaraka, Anarta, Sindhu (now Sindh, Pakistan) and Sauvira. All of them where trading / sea faring kingdoms. Sauvira is mentioned as 'Sophir' and its variant Abhira as 'Ophir', all referring to Indus Valley Civilization by texts of other civilizations that traded with IVC through land and sea. Thus, these names are found in many texts including Hebru Bible. This area is also mentioned as Suraabhira (the territory of the Suras and Abhiras and alternatively as the territory of the Sudras and Abhiras) where the once mighty river Sarasvati flowed in a partly dried up condition which is described vividly in Mahabharata. Current mapping of IVC settlement goes beyond the Sindh in Pakistan and extend to Gujarat, Rajastan, Punjab and Hariyana, which spans the kingdoms mentioned in Mahabharata such as Salva (where Krishna's enemy Salva ruled), Matsya (where Abhimanyu's father-in-law Virata ruled), Madra (where Pandava's uncle Shalya ruled) and Kurujangala (where Pandavas ruled). We thus have full mapping of the scenario depicted by Mahabharata in the civilization which is now known as Indus Valley civilization and more accurately as Indus Sarasvati civilization. The section of the Mahabharata from Chapter 12 forward dictates that Krishna lived during the Krita Age, which is another name for the Satya Yuga—which was from 11,500 BCE - 6,700 BCE. Book 12 Shanti Parva along with Book 13 Anusasana Parva is well known as late material added to Mahabharata corpus. Thus the reliability of information in these volumes is very less. Krishna lived in Dvapara Yuga - Kali Yuga junction in around 3000 BCE. His death marks the beginning of Kali Yuga, traditionally dated to 3102 BCE. Mahabharata contain more than 2000 chapters / adhyayas distributed in 18 books / volumes / parvas. Please locate your information with book number, chapter number and verse number to remove any other confusion you may have.